Aerial view of Cissbury Ring, courtesy of Historic England. 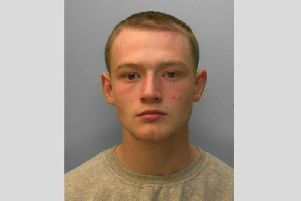 Provided by Sussex Police. Officers are investigating damage to an ancient hill-fort on the South Downs near Worthing, police have confirmed. Disturbance to the ground at Cissbury Ring suggests digging for items following the illicit use of metal detectors, police said. Sussex Police heritage crime officer, PCSO Daryl Holter, said the site is protected by the Ancient Monuments and Archaeological Areas Act 1979 and any contravention will be fully investigated. PCSO Holter said: “Illicit metal detecting is a shady unscrupulous act, and deliberate damage to this site is irreversible. He added: “There has been outrage from the ethical metal detecting community at this news. “The overwhelming majority of detectorists adhere to The Code of Practice for Responsible Metal Detecting and report their finds to both the landowner and the Portable Antiquities Scheme (PAS). National Trust archaeologist, Tom Dommett, said: “We are saddened to see this intrusion at such an important archaeological site, and the potential loss of priceless and irreplaceable information about our past. The use of metal detectors on Scheduled Monuments, without a licence issued by the Secretary of State, is prohibited, and metal detecting on National Trust land is only ever permitted under a special licence. NT countryside teams regularly patrol Cissbury Ring and the Trust is working with Sussex Police to address this latest issue. Paul Roberts, Historic England’s inspector of ancient monuments for Kent, Sussex and Surrey, said: “Irresponsible and criminal metal detecting destroys evidence of our national story that belongs to us all. Cissbury Ring, just north of Worthing, is one of the jewels in the crown of the new South Downs National Park. It is the largest hill-fort in Sussex and dates back more than 5,000 years. Its ditch and ramparts enclose some 65 acres of land. Anyone with information concerning damage is asked to e-mail 101@sussex.pnn.police.uk or phone 101 quoting serial 967 of 15/11. Alternatively they can call the independent charity Crimestoppers anonymously on 0800 555 111. (www.crimestoppers-uk.org).